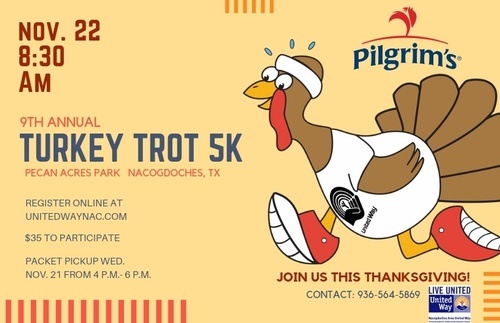 Join us for the Pilgrim's Turkey Trot 5K on Thanksgiving Day! Don't just sit on the couch Thanksgiving morning! Join us for the 9th Annual Thanksgiving Day Turkey Trot and pre-burn those holiday calories while having fun for a good cause! This holiday event supports the Nacogdoches Area United Way which engages and works to improve our community by supporting 20 community agencies in the areas of health, education, income and more. The course will take you out the back of Pecan Park, past Memorial Hospital, through the Stephen F. Austin State University campus, into the Raguet neighborhood, then onto a trail that skirts the edge of the Tucker House woods, where it meets and then follows the Lanana Creek Trail back to the finish in Pecan Park. It will be a beautiful sightseeing run, or walk! We look forward to beginning our holiday with you in the park! Packet pickup is Wednesday, November 21 from 4:00 - 6:00 pm at Pecan Park. Race-day registration and check-in begin at 7:30 am. The race will start at 8:30 am. T-shirts and race bags are guaranteed for those registrants by Friday, November 9. If for some reason you aren't able to participate in the event, and you would like your race shirt held for you, please notify us by email by Tuesday, November 20. If you want your shirt mailed to you, a $20 fee will be charged.